First cut a 5 3/4" x 9" piece of red card stock and fold it in half for the base, a 4 1/4" x 5 1/2" piece of pink for the middle layer and a 4" x 5 1/4" piece of white for the front layer. 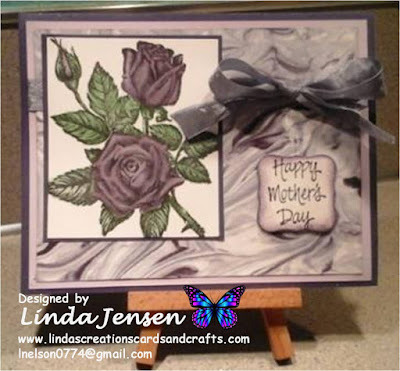 Next create the background: randomly rub pink and red Gelatos pigment sticks on white card stock, paint over them with a wet paintbrush to blend the colors and allow it to dry completely. Then rub and blend Gesso over the entire background with your finger or paintbrush until you have achieved your desired look and allow to dry once again. Meanwhile on another piece of white card stock stamp the three banners in Stampin' Up! 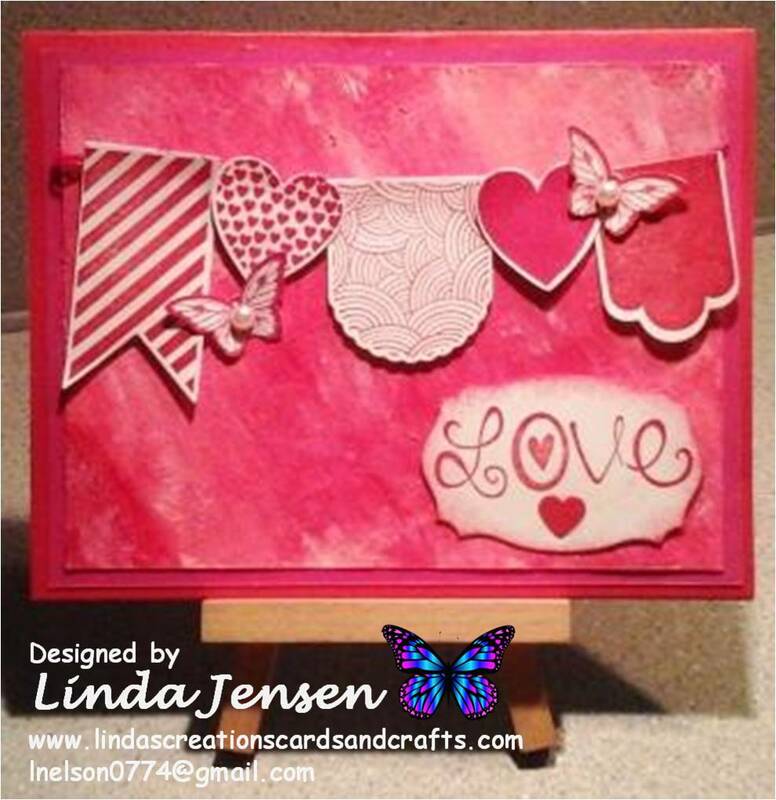 Real Red ink and the hearts in Stampin' Up! 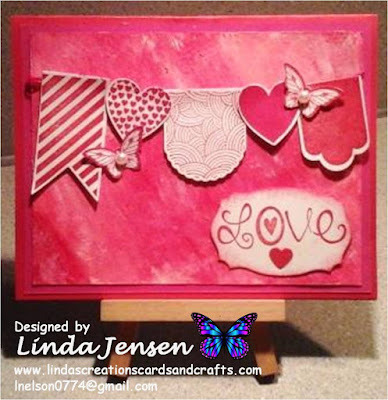 Melon Mambo ink and cut them out with Hearts a Flutter matching Framelits dies. Then stamp the butterflies with a stamp from a Stampin' Up! Papillion Potpourri set in Real Red and Melon Mambo inks, punch them out with a Bitty Butterfly punch and attach the self adhesive pearls. Next cut out the label for the sentiment with a Spellbinders Labels Twenty-Five die, sponge the edges with Melon Mambo ink, stamp the sentiment in Real Red with a misc. stamp, then punch the heart with a small punch and attach it to the sentiment. Then drape a piece of pink baker's twine across the front layer and attach it on the backs of both sides. Next begin assembling the card: attach the banners and hearts to the baker's twine with adhesive on the tops and mini pop dots on the bottoms, attach the butterflies and sentiment with mini pop dots, attach the front layer to the middle layer then the middle layer to the base and enjoy!